David Charles Jones was born on 9 July 1921 in Aberdeen, SD, and raised in Minot, ND, where he graduated from Minot High School. Jones graduated from Roswell Flying School in New Mexico in 1943, and from the National War College in 1960. He also attended the University of North Dakota, University of Nebraska, Louisiana Tech University, Minot State Teacher's College, Boston University, and Troy University. 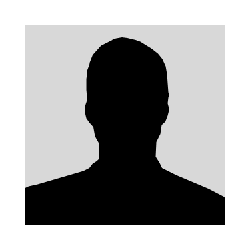 In 1943, he was commissioned a Second Lieutenant in the U.S. Army Air Forces. During the Korean War, Jones Commanded the 19th Bombardment Squadron, flying B-29 Superfortresss out of Kadena Air Base, Okinawa, Japan. Following Korea, he Commanded the 22nd Air Refueling Squadron and later the 33rd Bombardment Squadron, both at March Air Force Base, CA. After squadron command, he was transferred to the Strategic Air Command (SAC), where he worked in the Bomber Mission Branch before becoming aide to Commander-in-Chief, Strategic Air Command (CINCSAC), General Curtis E. LeMay. 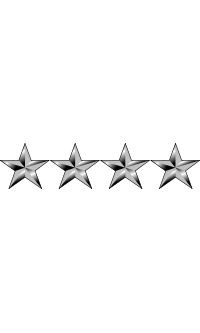 Jones advanced through the ranks and, on 1 September 1971, was promoted to the four-star rank of General. Jones was Deputy Commander of operations in Vietnam; Vice Commander of the 7th Air Force; Commander-in-Chief of the U.S. Air Forces in Europe (USAFE); and Commander 4th Allied Tactical Air Force. 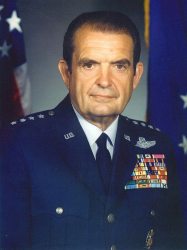 From 1974-78, he served on the Joint Chiefs of Staff as Chief of Staff of the U.S. Air Force. In 1978, he was elevated to Chairman of the Joint Chiefs of Staff, serving until his retirement from the Ari Force in 1982. General David Charles Jones is a member of the Air Force Association, the Falcon Foundation, the Council on Foreign Relations, the Alfalfa Club, the Bohemian Club and the Family. 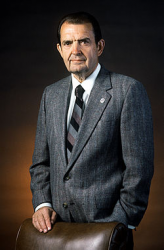 Jones photographed in retirement by Garfield Jones.